Technology is an important part of the home, and what better way for hoteliers to make guests feel at home than to provide them with state-of-the-art technological amenities? We are talking about a deeper level of connectivity than a simple iPod dock, or a reliable Internet connection in your hotel room. The trend in luxury hotels across the globe is a simple touchscreenwith an easy-to-use graphic user interface that can control all your room’s amenities, such as lighting, air conditioning, TV, movies,and music. These systems also have the capability to handle communication with the front desk, housekeeping, concierge, and checkout. The modern hotel also offers staff facility-wide monitoring and management capabilities. In fact, most of the major control companies are already entrenched in the hotel market, from Control4 to Crestronand AMX to Apple. Needless to say, hoteliers are jumping on the control bandwagon, which is the“wow” amenity of the moment that puts luxury hotels a cut above. At the legendary Plaza in New York City, Manhattan’s iconic NYC Apple Store sits just across the street. When the Apple iPad came out, the hotel’s general manager, Shane Krige, walked across the street and purchased a few to put in the hotel lobby for guests to play with. 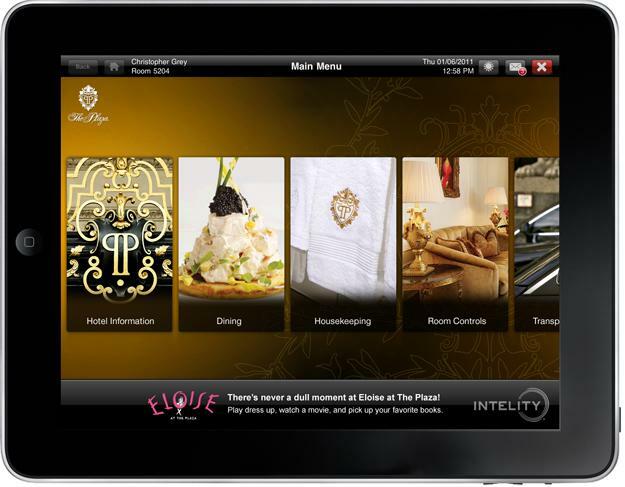 Once the Plaza team saw everything the device was capable of, they put an iPad in every room. Guests are greeted with a personalized welcome screen and a video from Krige explaining ICE, the Interactive Customer Experience.Once acquainted,you can control the room temperature or set lights at various levels from 100 percent to completely off. You can send messages to the front desk, request toothpaste from housekeeping, or ask the concierge for a restaurant reservation. Guests can arrange transportation or learn about the hotel, which just underwent a $450 million renovation. You can even check airlines and print boarding passes. A mobile ICE app in the works will be downloadable from the Plaza’s website, allowing you to do all these things before you even arrive. Across the sea in Sydney Harbour, Australia, the Star Hotel & Casino offers complete guest control in its 174 luxury suites.Guests get on-screen control of the television, IBAHN Video-on-Demand system, lighting and temperature, a Philips Dynalite lighting control system, a wireless thermostat, Samsung LED 3D TV, Bose Cinemate music system, and more. A Control4 system acts as the backbone, allowing simple control with a straightforward interface. The suites all feature a button labeled “Leaving Room” by the entry door that automatically places the suite in an energy-saving mode: With a single touch, it closes blinds, turns off lights and dials back air conditioners for energy savings. Should you forget to press this on your way out, after 30 minutes the system will sense there is no one and trigger the button automatically. Upon return your room will greet you by opening curtains, turning on the lights and displaying a welcome message. “Door Ajar” and “Privacy” notification pops up on the TV so you know you are safe and won’t be bothered by the hotel staff. At the Montage Deer Valley mountain resort in Park City, Utah, 154 deluxe guest rooms and 66 suites are equipped with a similar Control4 Hospitality Solution that lets guests control lighting,temperature, the fireplace, entertainment, privacy settings and energy-saving features. Hotel guests can enjoy theses effortless tech amenities while the hotel industry – known for its oversize environmental footprint — can reduce negative impact. 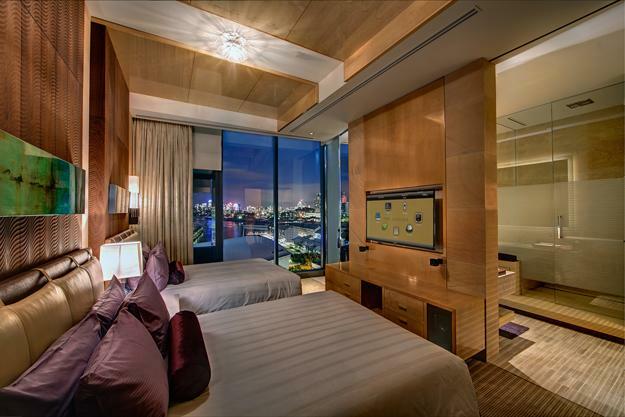 Crestron is also doing interesting things in the hotel industry, and has installed control systems in some of the world’s top hotel chains, including Marriott, Hilton, Hyatt, InterContinental Hotels Group, Four Seasons, and Starwood Properties. Crestron’s Hospitality solution is up to the challenge, monitoring and managing centralized AV sources and lighting controls for all areas of a hotel from a PC, Mac, iPhone, iPad, Android device and a local Crestron touch screen. As with Control4 systems, Crestron’s offers a number of ways to cut back on electricity consumption, from dimming systems to occupancy sensors and daylight harvesting. 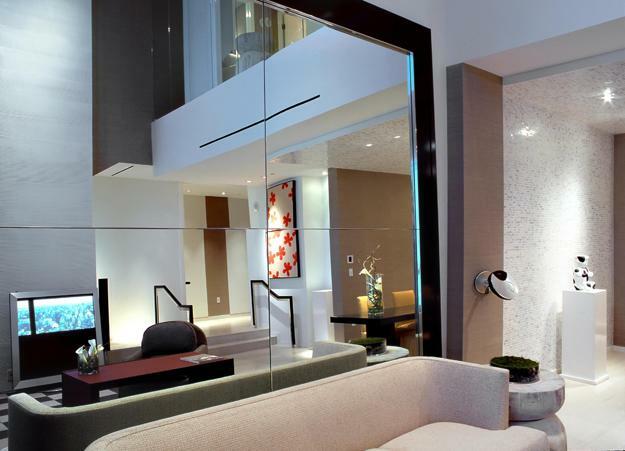 In-room amenities, including security, AV, and HVAC are standard. The environmentally minded Gateway Canyon Resort in Gateway, Colorado, for example, uses a Crestron system to control hotel-wide functions, including the Kiva Lodge, a 38-room hotel with fitness center, spa, café and pool area. The Crestron CP2E system controls AV and background music distribution throughout the lodge. Wall-mount touch screens and keypadsadorn the luxury space for walk-up, one-touch control. Kapari, another luxury, five-star hotel in Santorini Island provides not only the best views of the caldera and volcano, but high-tech room control for guests.To bring this group of villas firmly into the 21st Century, the hoteliers decided on a state-of-the-art AMX control system. Each room has a dedicated controller for managing room systems, such as drapes, HVAC, entertainment, and lighting. Each controller is connected back to the lobby desk, so that the receptionist can “prepare” the room, or even help customers control the room from afar. AMX also had a hand in the reconstruction of the historic Ukraina Hotel in Moscow, now dubbed the Royal Radisson Moscow.All the rooms were updated aesthetically, and AMX control added to each to make controlling A/V, lighting drapes, hotel account information, and food service as easy as possible, and in multiple languages. An outstanding user interface, created specifically for this project, allows guests to choose between different languages, including those that use the Cyrillic alphabet, Arabic and even Hieroglyphic. Also, special pictograms were developed for main functions, so it is easy for any guest to use a panel, regardless of language. AMX panels centralize the control of the audio-video systems and other electronic devices in all zones of the rooms. At the touch of a finger, drapes close or open and guests can set a mood with lighting. However, much of this functionality is automatic: Switching on the TV will automatically dim the lights and close the shades. At night all the lamps switch on and work with only 30m percent of their power, which is more comfortable for guests and also saves energy. So whether you’re headed to Russia, Greece, Australia, Utah, City, New York, or Colorado, make sure to ascertain your hotel’s tech capabilities to make your stay more enjoyable. 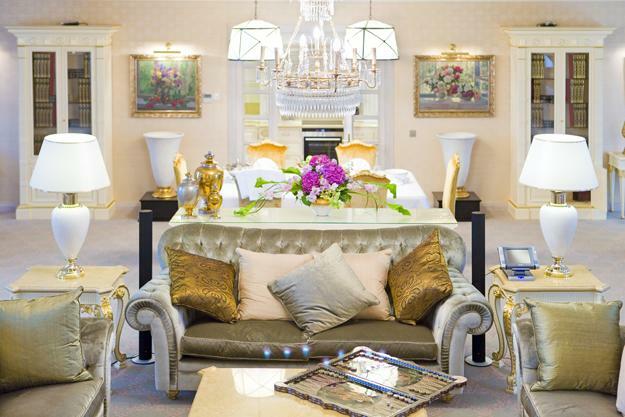 One thing is certain;luxury hotels are upping the ante for high-tech, simple, guest control. The ability to manage your room and account, plus communicate with the front desk and other hotel staff electronically is becoming standard in upscale hotels across the globe. We look forward to the high-tech trickle down when these tech amenities will be made available in hotels at every level.